The Communications Directorate of a group calling itself Concerned Youth Association of Asante Akim South (AAS), has congratulated the Director-General of the Criminal Investigations Department, COP Maame Tiwaa Addo-Danquah, on her promotion. The group in its statement signed by Ampem Nketiah Wereko said the hard work of the female police capo, got her promoted. The statement further prayed for COP Tiwaa Addo-Danquah to be appointed as the first female Inspector General of Police (IGP). 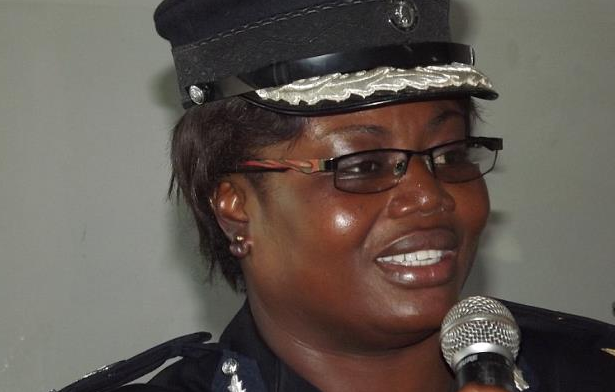 Maame Yaa Tiwaa Addo-Danquah, has been promoted to the rank of Commissioner of Police (COP). She is among six other Deputy Commissioners of Police (DCOP) who have been promoted to that rank, Graphic Online has gathered. The others are Mr George Tuffuor, Director-General of Finance, Mr Alex Amponsah Asiamah, Director-General of Services, Mr George Alex Mensah, Director-General of Operations, Mr Alphonse Adu-Amankwah, Eastern Regional Commander and Mr Timothy Yoosah Bonga, Northern Regional Police Commander. The promotions took effect from April 1, 2019, a memo issued and signed by the IGP David Asante-Apeatu announced last week. It was a great pleasure for the people of Asante Akyem South (AAS) when we heard a news release from the Public Affairs Directorate of the Ghana Police Service dated 05/04/2019 announcing your promotion from a Deputy Commissioner of Police (DCOP) to Commissioner of Police (COP). We are delight to congratulate you for your professional success. We could not hold our joy when the news was released. We must say that all this is a result of your hard work and determination. You have been able to gather accolades for your department and have been appreciated by your seniors, colleagues and the entire Ghanaian populace at various occasions. You have contributed greatly to the Police Service as well as the Criminal Investigative Department (CID) and giving your best in every situation. It is therefore not surprising to us when the President, HE. Nana Addo Dankwa Akuffo-Addo upon his recommendation to the Police Council promoted you to the rank of a COP. This affirms that the President is pleased with the work entrusted into your care as the CID Boss. There has been tremendous positive change since your inception at the department such as timely investigations, dealing with the recent kidnapping issues confronting the nation and also bringing the perpetrators of Ahmed Suale to book and many other things you are doing behind the scenes has brought about this promotion. We now believe that indeed the saying “what men can do women can do it better” is very possible because of women like you. It comes as not surprising to us that you are the household name of Asante Akyem South where both Men and Women, Young and Old and especially young women in the area draws their inspirations from you. No wonder most of our ladies wants to be Police women because you have made the Police work attractive and we say thank you Mum. It is our fervent hope and prayer that you are appointed as the first woman the Inspector General of Police (IGP). Once again, we congratulate you on your promotion. All the very best in all your future endeavors and may you touch the pinnacle of success with your consistency, ability and passion for the Police Service. Ayekoo!! !